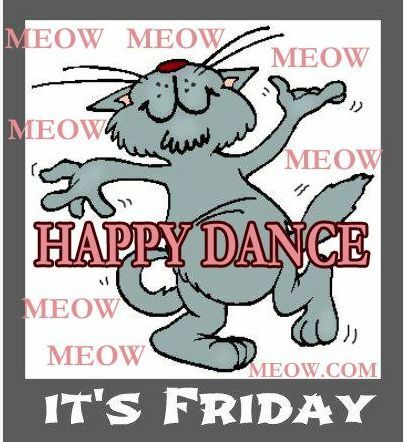 Have a furry, purry love and laughter filled weekend. (The drinks are on me)...! :). Hope your weekend is wondrous, Val. Hope your week-end is great Sandra. Bleubeard and Squiggles will dance right along with you. I'm still sticking near my bed. Have a happy one. I hope you get to feeling better soon. I hate that you're sick. Starts this afternoon for me with a movie! This is going to be a great weekend! Have a beautiful weekend! I am hoping to start organizing some old pictures! Warm and son and family coming to visit. It is going to be a good one. Glad you enjoyed it, Jamie. Woo Hoo! Happy Dance applies. Ready, set, go! We have relatives coming to visit this weekend. Lots of babies and dogs! So, it will be fun but a bit exhausting. Happy Weekend to you, Sandra! Hi Sandra, very cute! Have a wonderful weekend! The word Friday conjures all those Fridays when I was teaching! Saturday! Got ahead of myself. Aww SO cute! So far I've spent my weekend shopping for an outfit for a visitation and going to the visitation (relative I haven't seen in 20 years). Hopefully the rest of the weekend will be more restful! My condolences, Steph. Hope that the rest of your weekend is productive and pleasant. Happy Dance!! Boogy, boogy! LOL! Have a great weekend Sandra! Big Hugs! Well I know it was Friday when you posted this and now the weekend has gone!!! I do hope you had a good one, we did. My days run together for sure! What a lovely thing to say. Thank you, Ro. And back at ya.